Today was gusty like a regular dust storm, at least in Red Hook where I was a-working. And there was some music playing, by a feller named Woody Guthrie, and he was a-talkin about some dust storm in a song called “Talking Dust Bowl Blues.” In one verse, he sings, “My wife fixed up a tater stew,” and it got me hungry and thinkin’ food. So I’ll stop with the bad sing-song writing here, but now you know the reason for it. I tried to take best advantage of the taters’ natural sweetness by roasting them until golden first. Since I was doing that, I roasted the onions, too. And I made sure to buy types of both that would create the most caramelization, so it was red potatoes (with the skins on — waste not, want not! 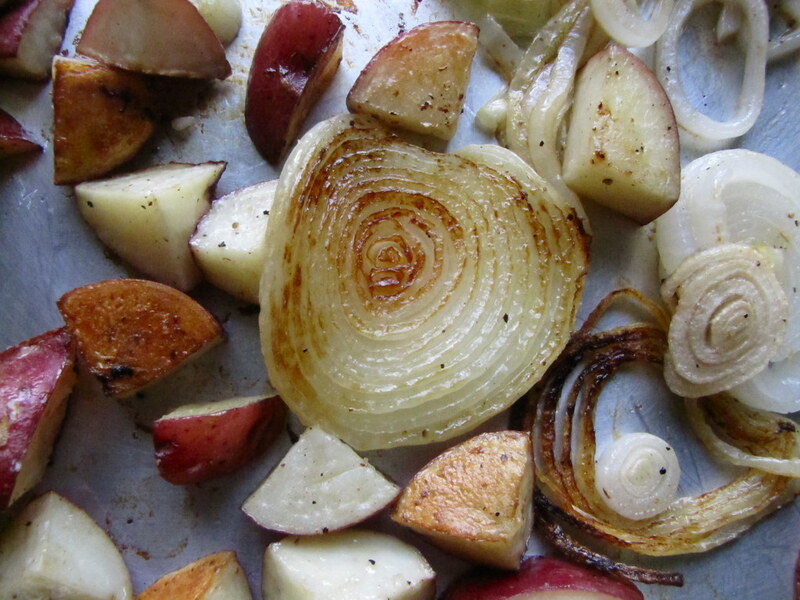 ), and Vidalia onions, on the roasting pan. You can use another waxy, less starchy potato with a good amount of sweetness instead, such as Yukon gold or fingerling varieties. I’ve just been roasting red potatoes for breakfast a lot lately, and noticed how tasty they were on their own. The leeks were left to sautee in the soup pot instead; I thought a more fresh, mild onion flavor would help round it out. The vegetable stock was made a few days ago, heavy on carrots and celery, with some cabbage thrown in just because it was leftover, too. It was a reddish-brown stock, and it turned even darker brown once I added the roasted potatoes and onions to it. They had caramelized as much as I’d hoped. Making soup, whether you’re working with luxurious ingredients or more paltry, is one of the most fun for me because it’s left to endless creativity. I’ve been known to squirt Sriracha into minestrone when no one was looking, or let a cinnamon stick sit at the bottom of the pot while simmering. It’s a playful pastime, and just like a painting, you can always alter the outcome as you go along. For this soup, I added one impulsive ingredient that I thought it could really use, not so much for flavor but for better survival, if you’re roughin’ it dust bowl-style: kale. You can stuff a lot of leafy greens into soup once they’ve wilted. I simply tore the crinkly leaves by hand over the pot and let them drop in. It was Dinosaur kale, so especially firm, although you can use any variety and for that matter, other nutritious leafy greens like spinach or Swiss chard, too. Beware of bitter ones, though, like mustard greens, which could completely overpower the delicate potato-leek base. So what started as a take on potato leek soup, with roasted vegetables, turned into a bit more of a well-rounded meal. Shouldn’t we all be so fortunate? Preheat oven to 375 degrees. 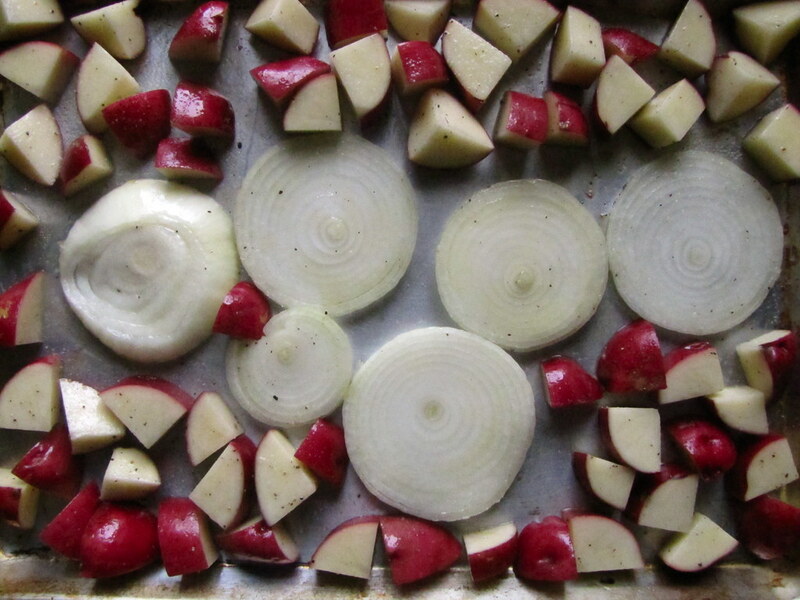 Coat the potato wedges and onion slices with olive oil, salt and pepper and arrange in a single layer on a roasting tray. Roast for about 15 minutes, or until golden on the bottoms. Flip onions and/or potatoes halfway into roasting if desired. Sautee the chopped leeks with butter in a large pot or Dutch oven. Season with salt and pepper. Cook, stirring occasionally, 6-8 minutes or until well softened. Add the stock, roasted potatoes and onion and bay leaf. Bring to a boil and reduce to a simmer; cover and cook 30 minutes. Remove bay leaf and use a hand blender to puree soup as much as desired (I like some chunks still swimming about). Add torn kale and stir over medium heat until wilted. Add salt and pepper to taste. Add the optional cream or half-and-half. Heat through (but don’t bring to a boil) afterward, and serve. Three brownie points: Roasting vegetables is a really good way to bring out its natural sugars… which is a really good way to add more sugars to your food. But this is a pretty innocent trick when you’re dealing with a soup that’s so wholesome and light. You could beef it up for a heartier occasion by sizzling up cubes of bacon along with the leeks at the beginning, or adding that cream and more butter. Just don’t forget to add the kale, or else the brownie points will start really adding up. 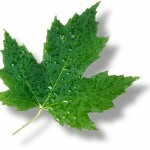 Eight maple leaves: This one is so roughing it winter farmers’ market-style. 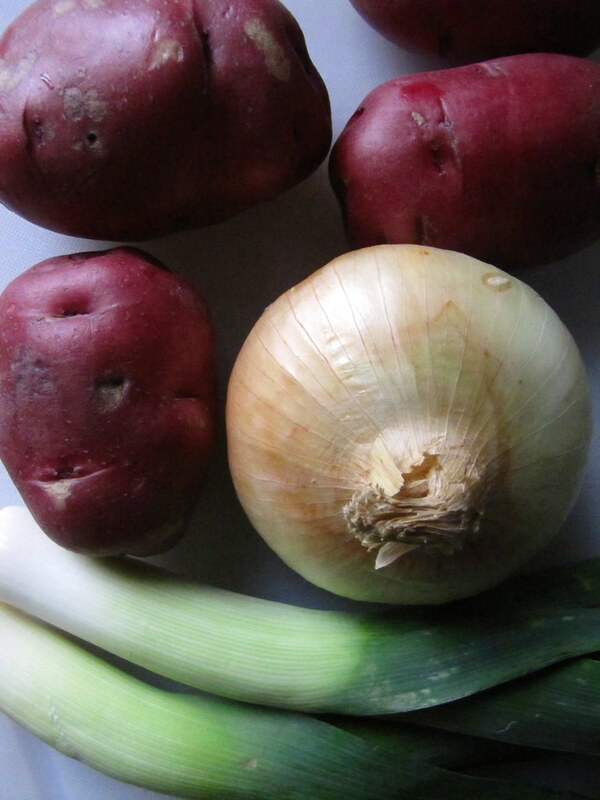 Potatoes, onions, leeks and kale have kept well throughout the winter and are still in good supply from local farms in my region, at least. Here’s to finding more ways to use them. 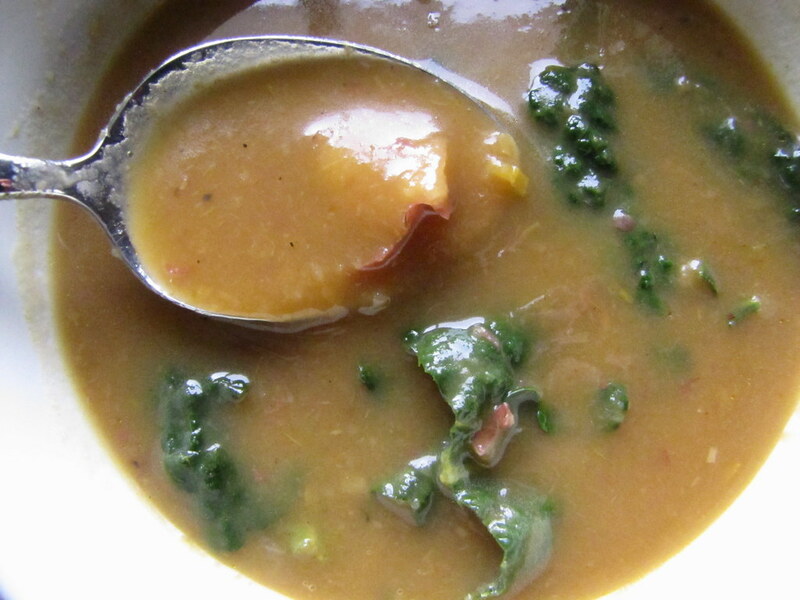 I posted a potato leek soup today also – I love your addition of kale – it reminds me of soup I ate in Portugal when I was young. I think next time I will add some to my soup! I would love it if you shared this with us at the Hearth and Soul Hop. this looks so good. if the union sq. greenmarket was open today i’d be scurrying down there asap. i *suppose* i can wait till tomorrow for my root veggie fix. What do you do with the dark green bits anyway? “Love Soup” has a very similar soup recipe. She tends to direct cooks to carmelize the onions in her soup recipes, also, and it does make a wonderful difference. Thanks – looks like a great meal! Kale, potatoes and leeks – healthy and delicious combination. I have to say I’d be adding the cream. It would just take the whole soup over the top. Lovely! 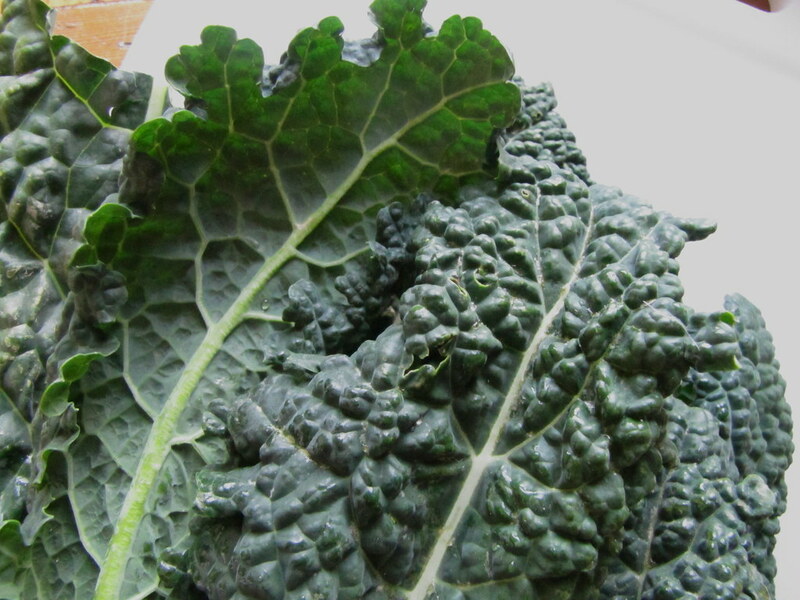 Samantha: Dinosaur Kale was found from Evolutionary Organics farm at Grand Army Plaza Greenmarket a few weeks ago. I know, it’s tough to find this time of year! 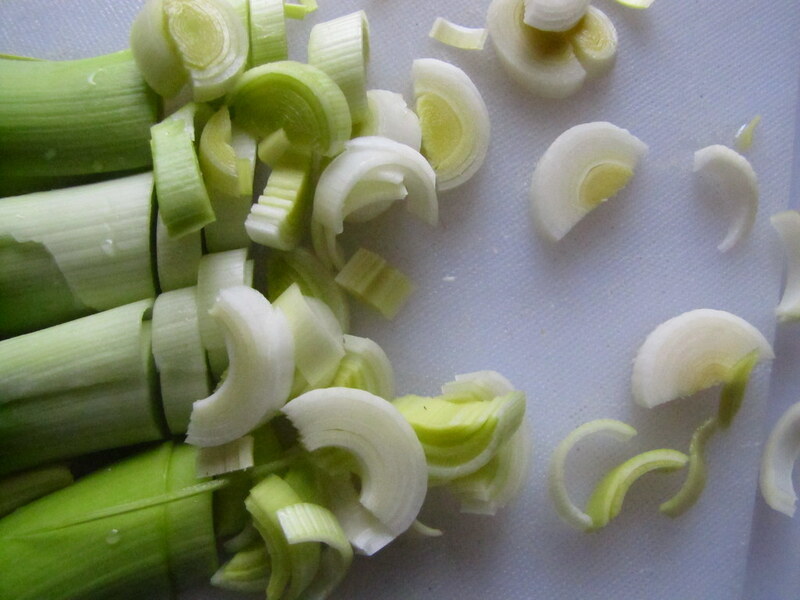 Matt: It’s sad, having to lose almost half the leek, I know… I save those to toss into stock, though — any kind! I just posted a roasted potato leek soup (Ina Garten’s recipe) but it had arugula instead of kale…kale sounds like a very nice option! I used the stems of the leeks in a veggie stock instead of throwing them out (you know, “waste not, want not”). Love your site. Your article is the best that I have ever read. Ill come back more often. I always bump up the protein to make it a more complete meal, so I added two cups of great northern beans to this recipe. Thanks for the yummy start! I haven’t made a leek and potato soup in ages. I like the idea of roasting the vegetables first and the addition of the kale. I’ll have to try this one before the weather turns too warm! food groups are carbohydrate, protein, and fat…. I made this soup the other night and it was Delicious! All though I made a few tweeks of my own. *I sprinkled a little bit of sea salt, black pepper and chili flakes on the potatoes & onion before putting in the oven. *I used only 1 Tbsp of butter and added 1 Tbsp of olive oil when I sauteed the Leeks in the dutch oven. * Before I added the Kale I took only part of the soup out to puree it (not the whole soup)… This added enough thickness so I didn’t have to use any sort of dairy or cream! *Also, I didn’t use the bay leaf..i’m sure it would’ve been delicious but i didn’t have one. Anyways! thanks for the recipe! Yum yum! The house smells amazing right now. I followed the directions to a t but added a few extra things.. Ham and corn. Can’t wait to have the soup for dinner tonight. I think this is going to become a family staple. 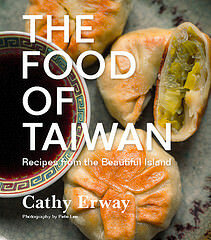 This is one of the very few times I have taken the time to write a review of a recipe.